The tunes of the Beatles reverberate through Wholefoods, the aroma of coffee permeates the air, and rainbows of vegetarian food decorate the white plates, as the Wholefoods community have their lunch. Beneath the ambience, 2012 was the beginning for a renewed student controlled and worker run Wholefoods, with a little help from Friends of Wholefoods, and helter skelter from graffiti. Sadly, Wholefoods said goodbye to its old volunteering system and free rent but got back something called Collective. Whether this revolution towards new glory days for Wholefoods continues, depends on whether the warriors of love fight for a Wholefoods flying freer like a bird, or the murmuring whisper is to let it be. The plans to restructure the Wholefoods space without input from those who use the space (including the Collective, staff and customers) were exposed and halted for the time being. Secret discussions regarding the potential introduction of meat into Wholefoods were also uncovered and exposed. The MSA-appointed manager who rarely worked with the student Collective was replaced with two student coordinators who work closely with the Wholefoods Collective. The Wholefoods Collective were enabled to draft and submit a 2013 budget to the MSA Budget Committee that was largely accepted. Over $20,000 of MSA expenses inappropriately allocated to the Wholefoods budget (such as the legal advice misused to ban volunteers, former manager costs, and equipment used by Sir John’s Bar) were expunged. Overall we are pleased to see the progress that has been made with the Wholefoods Collective and the MSA Executive now working more constructively together. However, there is still some way to go in terms of ensuring a Collective/worker run Wholefoods that is open to the voluntary participation of all students. 2012 was the first year in Wholefoods’ 35-year history where there was no volunteering in the kitchen or the cafe. While the MSA Executive have been asserting, since March 2012, that volunteers will soon be volunteering in Wholefoods again, volunteers have not yet returned to the kitchen or cafe. We hope that the MSA will allow students to once again volunteer and receive a fair reward by the start of 2013. Furthermore, the surveillance cameras installed in Wholefoods during the height of the Save Wholefoods campaign have not yet been removed. The MSA Executive has agreed to have the surveillance cameras removed from the Wholefoods space after protest from kitchen and café staff, as well as from Friends of Wholefoods. 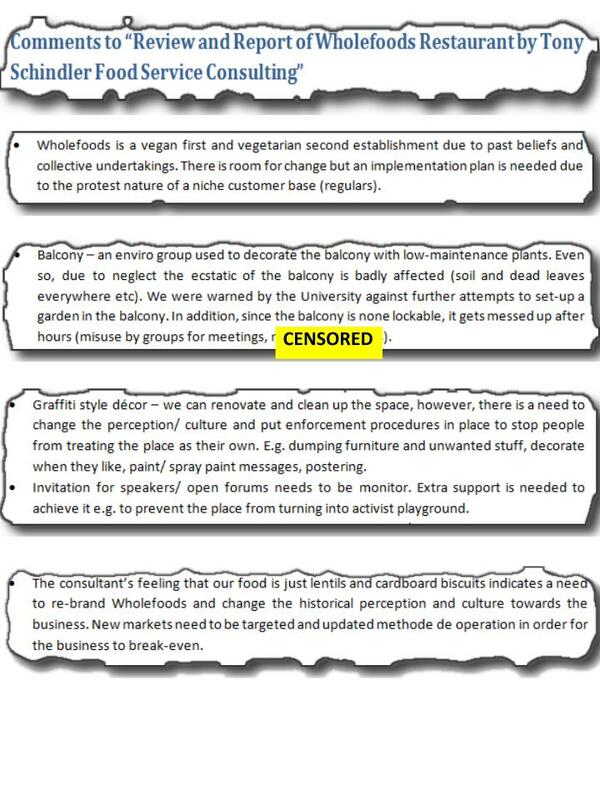 The mediation that had been taking place between the MSC Executive and the Wholefoods Collective ceased when Wholefoods Collective members became uneasy with the MSA’s idea rushing into cutting Wholefoods loose through incorporation via a referendum question at the MSA elections. Collective members cited concerns that incorporation would likely entail a high commercial rent from the University, which could ultimately bankrupt Wholefoods. 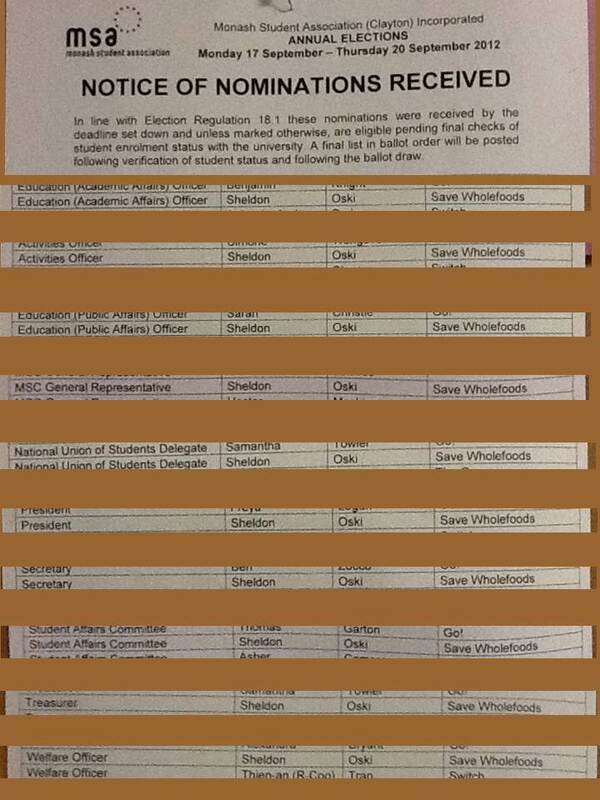 Moreover, the original Student General Meeting (SGM) petitioned by more than 400 Monash students did not eventuate after it was delayed beyond the original petition’s call for a meeting in August. An alternative SGM proposal from the MSA Executive was rejected by Wholefoods Collective when it became clear that this rescheduled meeting would be unlikely to have the minimum numbers to make decisions binding and involved a lack of constitutionally enforced advertising to inform students. Finally, last Thursday the MSA Executive signed off on its controversial Funding Agreement with the University, which states that Wholefoods will pay $80,000 rental fee to the University every year. 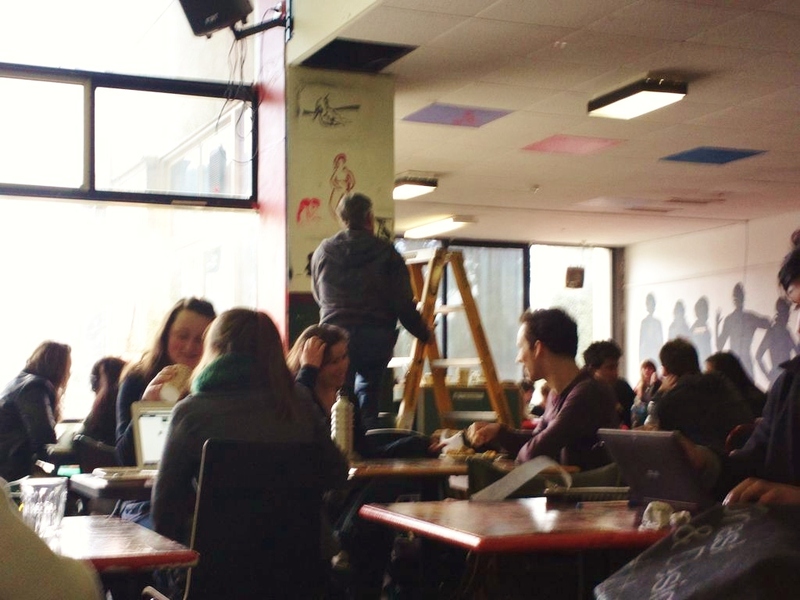 Previously Wholefoods, like other MSA student spaces, paid no rent. The agreement guarantees rent will be offset by an equal subsidy, until the agreement ends at the end of 2014, when there is the possibility that subsidies may be reduced or withdrawn completely, thus possibly further threatening Wholefoods’ future financial viability. Yet despite these ongoing concerns, in light of the progress that has been made in the last few months, and with a new MSA administration and a reinvigorated Wholefoods Collective, 2013 looks more promising for Wholefoods. The Wholefoods Collective envisages a Wholefoods that is not limited to simply being another restaurant and cafe on campus, but rather a community and cultural hub for a diverse range of students. We envisage a thriving Wholefoods that regularly hosts both social and political events and groups ensuring a dynamic space open to alternative ideas. We see a thriving Wholefoods as managed by the Wholefoods Collective in a constructive and mutually respectful relationship with the MSA hierarchy. A thriving Wholefoods redevelops an alternative economy, based on local food and produce, and encourages self-organisation of students and the wider community. Here’s to 2013 and a vibrant student-controlled and worker-run Wholefoods! The Wholefoods Collective is currently taking expressions of interest in volunteering in Wholefoods in 2013! Please take a moment to fill in the form. Wholefoods Volunteers have been essential to the operations and philosophy of Wholefoods since Wholefoods began in 1977. When the Wholefoods community met one of the founders of Wholefoods a number of years ago, he was disappointed that – besides the cook – there were any paid staff at all. The second aim of the Wholefoods Constitution reads that Collective are: “To encourage voluntary student participation at all levels of operation of Wholefoods, in an atmosphere of mutual respect and cooperation”. 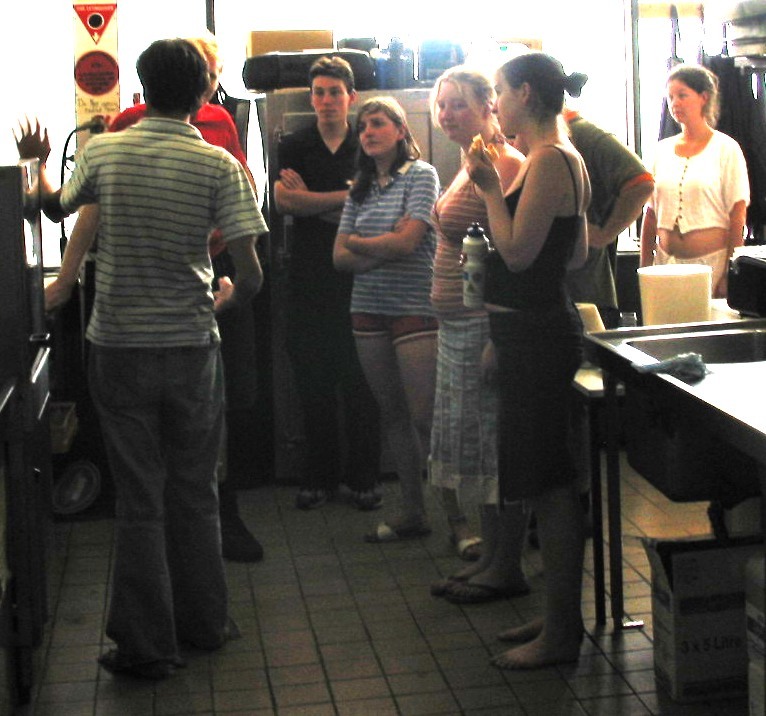 This year – amidst the dispute with the MSA taking control – volunteering has been effectively abolished – in part – because the One Meal for One Hours Work was dissolved by management. The MSA believes, after legal advice, that this constitutes an “employment relationship” – the Wholefoods Collective and Friends of Wholefoods disagree. We believe that in one way or another this can be resolved. Fill in the form with the areas of Wholefoods you’d be interested in being a vollie in! 2. Catering can be expanded with more support. 3. The core customer base has to be one that is not affected by University scheduling trends. 4. The business needs to have 4 service periods. (Take-away can be used as an alternative to a service hour if necessary). “Balcony – an enviro group used to decorate the balcony with low-maintenance plants. Even so, due to neglect the ecstatic of the balcony is badly affected (soil and dead leaves everywhere etc). We were warned by the University against further attempts to set-up a garden in the balcony. In addition, since the balcony is none lockable, it gets messed up after hours (misuse by groups for meetings, ******** ******* ). Graffiti style décor – we can renovate and clean up the space, however, there is a need to change the perception/ culture and put enforcement procedures in place to stop people from treating the place as their own. E.g. dumping furniture and unwanted stuff, decorate when they like, paint/ spray paint messages, postering. Invitation for speakers/ open forums needs to be monitor. Extra support is needed to achieve it e.g. to prevent the place from turning into activist playground. The Wholefoods Collective understands that the University – as part of the MSA President’s lease agreement negotiations for the MSA – will start formally charging the MSA $80,000 rent per year for the Wholefoods space, which will be offset by an equivalent subsidy of $80,000 provided to the MSA. Currently, because Wholefoods is an MSA space, the University agrees to provide the space “free of charge”. The reason for a new form of lease arrangement is ostensibly to “regularise the use and possession of the Wholefoods space,” as stipulated in a past SSAF Funding Agreement. Presumably these changes are intended for the convenience of the University and the department that manages the Campus Centre spaces. However the precise meaning of this so-called “regularising” is still not clear and requires further explanation. The MSA President has repeatedly told Wholefoods Collective members that the changes are mere formalities and will have no substantial effect on the MSA or Wholefoods. Yet Wholefoods Collective maintain grave concerns about the newly proposed rental arrangement; indeed, we suspect that it may be a potentially duplicitous move by the University to begin charging a commercial or subsidised commercial rate of rent for MSA spaces in future, undermining the MSA’s (and consequently the Wholefoods Collective’s) capacity to provide essential welfare services for students. For example, we believe that there is a distinct possibility that the University will simply withdraw (or threaten to withdraw) the “offset money” to the MSA for the Wholefoods space, while continuing to maintain the $80,000 charge in rent. This could be potentially disastrous for Wholefoods and the MSA. These concerns of ours are not unfounded. We refer you to the example of the “data charges” that the University started invoicing the MSA for a number of years ago while also providing “offset money” to the MSA to pay back to the University. In this arrangement the MSA was not substantially affected by a new cost burden, at least initially. However the University soon stopped providing a subsidy for the data costs, leaving the MSA bearing the full cost of the data charge. 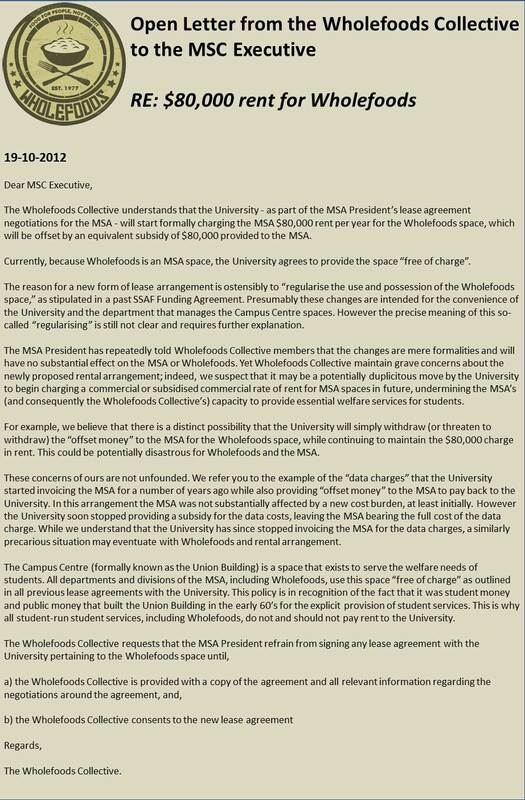 While we understand that the University has since stopped invoicing the MSA for the data charges, a similarly precarious situation may eventuate with Wholefoods and rental arrangement. The Campus Centre (formally known as the Union Building) is a space that exists to serve the welfare needs of students. All departments and divisions of the MSA, including Wholefoods, use this space “free of charge” as outlined in all previous lease agreements with the University. This policy is in recognition of the fact that it was student money and public money that built the Union Building in the early 60’s for the explicit provision of student services. This is why all student-run student services, including Wholefoods, do not and should not pay rent to the University. At the Monash Student Council (MSC) meeting today the Student General Meeting (SGM) for the 9th of October was finally cancelled. The Executive did not acknowledge their push for an SGM in Week 11 was tokenistic in failing to honour the original SGM’s call for a meeting in August. Tellingly, for the first time this year, MSC lost quorum when a motion was presented detailing misappropriation of line items in the Wholefoods budget, meaning the meeting immediately closed. We have uncovered two major irregularities in the Wholefoods budget and a third notable item, which a motion we presented to MSC on the 3rd of October aimed to resolve. First, we found the MSA-appointed Wholefoods Manager and Wholefoods Chef salaries are still being charged to the Wholefoods budget, despite them not working in Wholefoods this whole semester. In fact, they most recently were working at Sir John’s Bar, despite their salaries being charged to the Wholefoods budget. They have both since left the MSA, but by the end of the year both will end up being paid around $40 000 extra than they have actually worked because of contractual obligations. Second, $10,651 in legal fees were charged to the Wholefoods budget, the first time we know in MSA history this has not been charged to the Monash Student Council line items. Wholefoods Collective did not authorise this transaction, the MSA Executive did in response to questions regarding the MSA ‘Volunteer Reward Program’, they imposed over the summer break. Third, although the Wholefoods Collective were never involved in the production of redesign documents, Tony Schindler Food Service Consulting were engaged twice for $6798 and $2508, charged to the Wholefoods budget. In summary, due to these irregularities and consultations, Wholefoods is heading for its largest loss in its history, of roughly $100 000. It remains to be seen whether this is a deliberate pretext to radically change Wholefoods over the summer break. a) the continual funding of the former Wholefoods Manager and former Wholefoods Chef from the Wholefoods budget as unreasonable. The total amount paid to these two former employees will reach up to $40,000 by the end of the year. Since neither former employees have been working in Wholefoods this semester and have in fact been working at Sir John’s Bar, the attribution of their salaries should be redirected from Wholefoods to Sir John’s Bar (for the period of time worked there), and otherwise from the MSA general Overheads budget for time not worked, in keeping with sound accounting practices. b) the charging of costs associated with the services of Tony Schindler Food Service Consulting to Wholefoods of $2508 on 31/1/2012 and $4290 on 25/7/2012, totalling $6798 from line item 601500 from the Wholefoods budget. c) the legal advice procured by MSC Executive pertaining to the Wholefoods Volunteering system attributed to 620200 Legal & Financial Service of $10,651, ought to be deducted from the MSC budget. Finally, we direct the MSA President to investigate this misappropriation and provide a written explanation for why this has occurred by the next MSC. In the spirit of constructive dialogue, we welcome future discussions with the Executive and a mutually agreeable solution soundly based on extensive research. 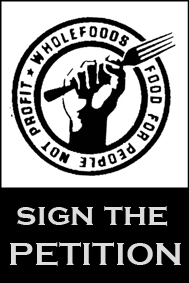 We are writing to reiterate our concerns regarding the decision the MSA Executive made this year to entirely abolish the Wholefoods Volunteer Meal Voucher System – a thirty-five year old legacy of Wholefoods, predating Wholefoods status as an MSA department – as well as the decision not to reinstate the Wholefoods Volunteers Coordinator position to facilitate that system. Wholefoods, being a department of the MSA, must adopt the MSA Volunteer Reward Program and function under no other volunteer system but this one. To institute an alternative system would be against ‘MSA policies’ and even constitute an unlawful act. ii. The roles and responsibilities of a Wholefoods Volunteers’ Coordinator already fall under the position description of the MSA Volunteer Coordinator. In this letter we address each of the concerns listed above and also share with you some serious concerns of our own. Wholefoods, being a department of the MSA, must adopt the MSA Volunteer Reward Program and function under no other volunteer system but this one. To do so would be against ‘MSA policies’. Relative to how the Wholefoods volunteer system once worked, the MSA Volunteer Reward Program is inadequate and has critical shortcomings. The program shows a poor understanding of just how valuable (socially, functionally, morally and economically) Wholefoods volunteers are to Wholefoods. The program completely disregards and undermines our hugely successful 35 year-old volunteer system that was integral to the institution of Wholefoods itself. Wholefoods was started as an all-volunteer, student-run food outlet. From the very first bowl of dahl served till today, volunteers have been the lifeblood of Wholefoods. We believe that this lifeblood has been completely sucked dry this year. The projected loss of $60,000+ for Wholefoods in 2012 is frankly alarming and unacceptable. It is the highest loss Wholefoods has ever incurred in its history and we believe that the MSA’s annulment of a Volunteers’ Coordinator position in 2010, the abolition of the volunteer system in 2012 and the hierarchical implementation of expensive full-time managers this same year is the primary cause for this deficit. We need a system in place that understands the importance of volunteers, that appreciates and rewards them meaningfully. The MSA Volunteer Reward Program grossly undervalues the work of Wholefoods’ volunteers. Where Wholefoods volunteers once worked 1 hour for one meal ticket, under the new MSA Volunteer Reward Program, they are now required to work 15 hours for one meal ticket equivalent. (How? 1 hour volunteered and logged rewards volunteers with 1 point. Accruing 6 points gets you a $3 MSA voucher. You must now volunteer 15 hours to earn the equivalent of an old Wholefoods meal voucher – $7.50). To put this in to perspective, volunteers work on average 1 – 3 hours a week at Wholefoods. This means they will need to wait at least 5 weeks before they are even rewarded their first meal. As an existing precedent, we are in favour of programs like the MSA’s Host Scheme whereby hosts get free meals/drinks at every event they volunteer at. Rewarding volunteers is a vital part of creating any relationship whereby volunteers feel respected, appreciated and valued. The MSA Volunteer Reward Program rewards points based on ‘skills’. This point system arbitrarily compares skills of different MSA Departments i.e. The Bikery, Host Scheme, Monash Uni Student Theatre (MUST) and Wholefoods. Skills required in the Wholefoods kitchen will be different to skills required to host an info night for Host Scheme and these skills cannot be compared and tallied up in a point system that proclaims to be fair. We believe this system is arbitrary, pre-mature in its development and does not cater to, nor foster, the uniqueness of each Department. 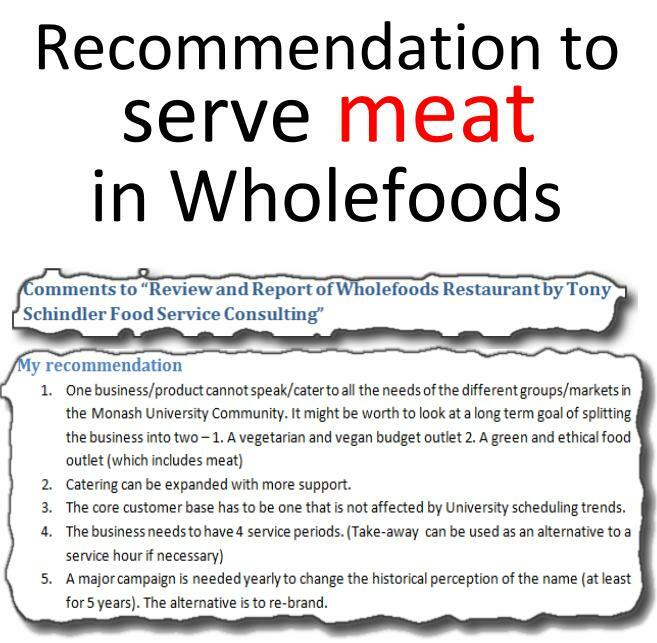 Previous MSA Executive concerns about the Wholefoods Meal Voucher Volunteering System constituting an ‘employment relationship’ with volunteers are easily circumvented with a Memorandum of Understanding signed by prospective volunteers (advice from Volunteering Victoria). This practice of exchanging a meal for volunteer labor is commonplace among many not-for-profit volunteer based organisations across the country. Alternatively, the MSA Volunteer Agreement document already does this and the MSA Volunteer Policy (points 1 and 6) alludes to such understandings. We understand the necessity for all volunteer programs to comply with MSA Volunteer Policy and recognise the mention of the Volunteer Reward System (point 6) in such document. This is not our main point of contention. 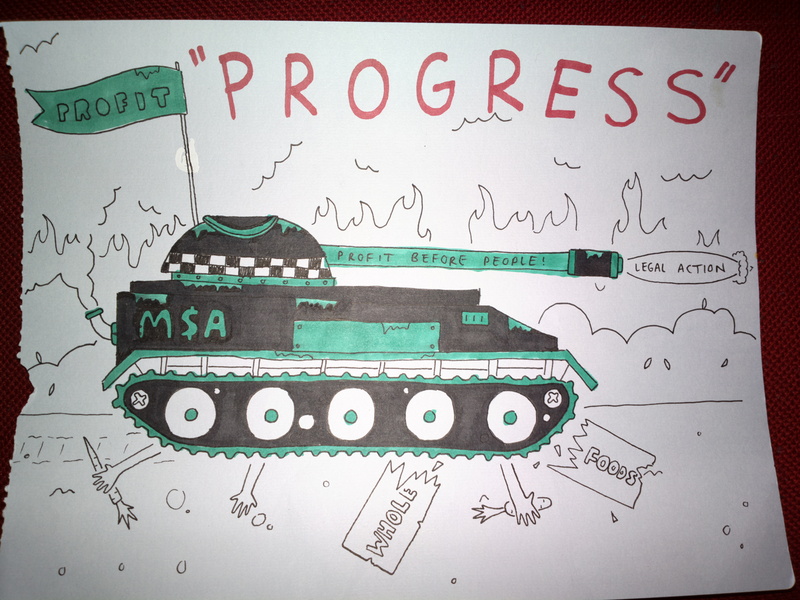 Not only have the Executives of the MSA insisted upon the overhaul of a well- functioning volunteer system and replaced it with one that is clearly incompetent and costly, the transition has been conducted in a highly non-transparent manner. We are yet to see any documents that stipulate that all MSA Department volunteers must fall under the new MSA Volunteer Reward Program, and abandon any existing volunteer system of their own. We would greatly appreciate a copy of this document as soon as possible – this is something that should have taken place in semester one and involved the appointed Volunteers Co-officers of Wholefoods and the Wholefoods Collective, people who are directly involved with the management of volunteers inside the space. Wholefoods must adopt the MSA Volunteer Reward Program to help maintain a sense of equality within the greater MSA volunteer network. 1. Wholefoods is a student-run restaurant, for students, by students. Students and non-students alike can volunteer at Wholefoods. There are no exclusions. Wholefoods’ old volunteer system was there for everyone to enjoy and benefit from. In fact, the system ensured that all volunteers could be fed at least one meal each day – no other department can guarantee a service such as this. If anything, Wholefoods has provided a service and opportunity that enriches the MSA volunteering network and the general student body alike. 2. Wholefoods has sustained this volunteer system for nearly 35 years. It is a system that has been working since the day of its inception in 1977. With significantly reduced rewards, volunteering at Wholefoods will appeal to a less diverse group of students. Less appeal means fewer volunteers, a reduction in the vibrancy of our pulsating community, less income and inevitably, an increase to food prices. 3. Having volunteers keeps costs and stress levels down. It also means that work-load is better divided, there is less time-stress on staff and more quality food can be produced. Better food means more patrons. More patrons means better chances of breaking even at the end of the year. 4. We reject the notion that the Wholefoods reward system is unfair to other volunteers within the MSA volunteer community. Wholefoods volunteers should not be penalized on the basis that it makes other volunteer systems appear inferior. The Meal Voucher System has always worked well for Wholefoods and it would be ignorant, offensive and highly defamatory to suggest that volunteers and this system are to blame for any years of financial deficit. While we genuinely appreciate the concern MSA Executive have for the job security of future Wholefoods staff, the Wholefoods Collective will ensure that no coordinator will be left behind when, or if Wholefoods makes the transition into becoming incorporated next year. To substantiate our gesture, we have collectively agreed to signing a Memorandum of Understanding (MOU) with a Collective appointed Wholefoods Volunteers’ Coordinator to ensure that their position does not become redundant once the hand-over has occurred and that an incorporated Wholefoods Collective will see them through to the end-date outlined in their initial contract with the MSA. 2. The roles and responsibilities of a Wholefoods Volunteers’ Coordinator already fall under the position description of the MSA Volunteer Coordinator. While we appreciate the work completed by the MSA Volunteer Coordinator thus far, we believe it is important that Wholefoods have its own Volunteers’ Coordinator who is appointed by the Wholefoods Collective as has been the case in the past. Wholefoods deals with hundreds of volunteers and our O-week stalls, induction and training sessions can be particularly idiosyncratic. It is expected that the Volunteers’ Coordinator be an active member of Collective meetings and report back at Collective meetings once a month. On top of that, Wholefoods has its own Constitution that forms the backbone of the café, restaurant and space. Our Volunteers’ Coordinator should be someone who understands and values our Constitution or someone who has experience working in a space with a similar anti-hierarchical, collective-run set-up to Wholefoods. We believe what we have outlined so far has provided you with sufficient grounds to understand where we are coming from and what we would like to be working towards. That the successful Wholefoods Volunteer Meal Voucher system be immediately reinstated with a Memorandum of Understanding (MOU) signed by each prospective volunteer, outlining that any reward for their service is given as an honoraria and is not a substitute for wages. That a Wholefoods Collective approved Wholefoods Volunteers’ Coordinator be immediately appointed at the behest of the Wholefoods Collective to facilitate the re-introduction of volunteers into the space. Wholefoods volunteers have always played a key role in the operations of Wholefoods. Their work deserves to be acknowledged and treated with due respect and appreciation. The MSA Volunteer Reward Program does not acknowledge this hard work and in-fact has been highly unfavourable amongst our Grocery volunteers this year. We hold strong reservations about enforcing such a program on our volunteers and trust that the Executive can work with us on bringing back the successful, viable and highly popular Wholefoods Volunteer Meal Voucher system. We will be CC’ing in the Wholefoods Collective e-list to this email and letter and emailing Friends of Wholefoods to put this up on their blog and Facebook page. We believe what we have touched on in this email needs to be publicised as there has been much silence and secrecy surrounding the Wholefoods Volunteer system this year. If we can work together in achieving our outlined demands we believe the relationship between the MSA Executive and Wholefoods will remain harmonious in the interim period between now and a potential incorporation. We look forward to hearing back from you promptly. The Wholefoods Collective and the MSA Executive have continued their negotiations to secure the future of Wholefoods. The proposal, put forward by the MSA Executive, planned to incorporate Wholefoods and remove it from the MSA Constitution through a referendum at the MSA elections in two weeks, contingent on Exec and Collective agreeing on details at a later date. However, on Monday, Collective argued it was too soon to approve the proposal. Collective members stated that the details of any agreement should be decided before taking it to a referendum, for several reasons. First of all, members thought that it was necessary for students to be able to make an informed decision. Secondly, after informal legal and financial advice, Collective members felt that rushing into incorporation could put Wholefoods’ future at risk. Collective members are not necessarily opposed to incorporation, but believe it is in the best interests of all involved to take their time to ensure decisions are based on a full exploration of all issues. Negotiations with the MSA will continue in the interim, with the Executive considering the idea of bringing back a Volunteers Coordinator and volunteers, which the Collective supports. However, the Executive has yet to explicitly rule out renovations to Wholefoods over the summer break, which have been planned since mid-2011. All documents relating to the renovations remain confidential, unseen by the Collective. The opportunity that the mediation has given to discuss issues that have been concerning the Wholefoods community over the past few years was appreciated, but despite members’ earlier optimism and the Executive’s positive take of the recent process of mediation, serious concerns remain.